Most (but not all) of the videos that you can see on the Internet can be scraped and stored permanently on your Windows 10 iPad or iPhone. That can be very useful if you’re going to be someplace that doesn’t have an Internet connection for your iPad, or if you (or your kids) are going to watch the same video over and over, and you don’t want to pay for repeatedly downloading the same clip. Many products will scrape videos off the Internet. KeepVid was one of the first, but it’s fallen into disrepute lately, with Google reporting security problems. Try the Firefox Video DownloadHelper add-in. When you install Video DownloadHelper in Firefox, it watches to see whether scrapable videos are on the page you’re viewing. If there are, a little icon starts rotating. Tap or click the icon, and download the video. Easy. The trick with KeepVid, Video DownloadHelper, or any other video scraper you find is that you need to have it produce videos in MP4 format. Although MP4 isn’t a format as much as it’s a group of formats (details too boring to recount here), most of the time, MP4 files play just fine on an iPad. Or anywhere else, for that matter. Of course, you don’t do this for copyrighted material or on sites that otherwise expressly forbid it. Use Video DownloadHelper or a similar scraper to produce MP4 files. Start iTunes. On the left, under Library, tap or click the Movies line. iTunes doesn’t have any way to make a playlist of movies just yet, but you can still play individual movies with your iPad’s built-in Video app. Locate the MP4 files in File Explorer. Switch iTunes over to the Movies folder by clicking the strip in the upper left that looks like a couple of movie frames. Then drag and drop the movie files into the iTunes Movies folder. A thumbnail of the movie appears if you click Home Videos, as shown. 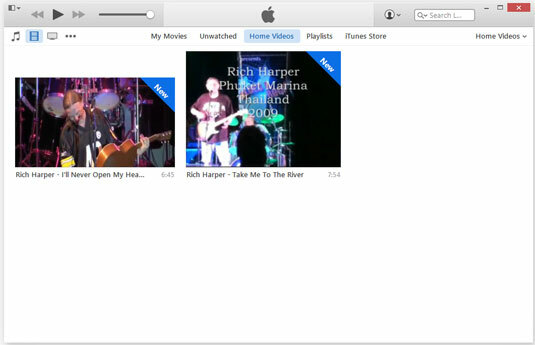 Drag MP4 movies into iTunes, and then sync to get them on your iPad. When you’re finished dragging all your MP4 files into the Movies folder, connect your iPad or iPhone and sync. If the movie will play on your iPad or iPhone, it gets copied over to the device. Once in a while, the movie won’t sync properly. For some reason, if you drag the movie from the iTunes\Library\Movies folder to the iPad Movies folder, it gets copied onto the iPad.